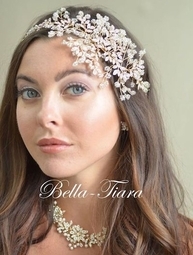 Description: This stunning rose gold plated headpiece by our designer collectionl will dazzle at your wedding! The dramatic hand-wired side accent headband features an intricate vine design of crystal sprays. versatile could be used in many of today's hair looks.